From 1988-1990, the PBSF founders produced events in association with the Chamber Theatre of the Palm Beaches and Young Audiences of Palm Beach County. Their success lead to the formation of the Shakespeare Festival in January 1990. Their premiere production was in March, featuring Shakespeare’s MACBETH at the Duncan Theatre, Palm Beach Community College, West Palm Beach campus, with Burt Reynolds as Honorary Chairman. In September 1990, PBSF moved to Carlin Park, Jupiter, and premiered Shakespeare by the Sea:A Renaissance Festival and PIay-in-the-Park, featuring Shakespeare’s comedy, TWELFTH NIGHT. The event attracted over 10,000 people in one weekend. Shakespeare By The Sea has continued as an annual event, featuring THE TEMPEST (’91), MIDSUMMER NIGHT’S DREAM (’91), RICHARD III (’92), AS YOU LIKE IT (’93), ROMEO AND JULIET (’94), TWELFTH NIGHT (’96 amphitheatre premiere), MACBETH (’97), THE WINTER’S TALE (’98), MUCH ADO ABOUT NOTHING (’99), HAMLET (’00 Tenth Anniversary feature), THE COMEDY OF ERRORS (’01), TAMING OF THE SHREW (’02), and ROMEO AND JULIET (’03). Since its inception, PBSF has toured to numerous South Florida schools, as well prominent theatres, community centers and festivals in Palm Beach and Martin County. For two seasons, PBSF founded and operated Theatre At The Harbour – Palm Beach Gardens, presenting new works and children’s programs. In 1990, PBSF premiered at its “outdoor home,” Carlin Park, an oceanfront park in Jupiter. Subsequently, the County Commission and Department of Parks and Recreation designated the park as the North County Cultural site and built an amphitheatre (capacity of 3,000) which was debuted by PBSF in January of 1996. 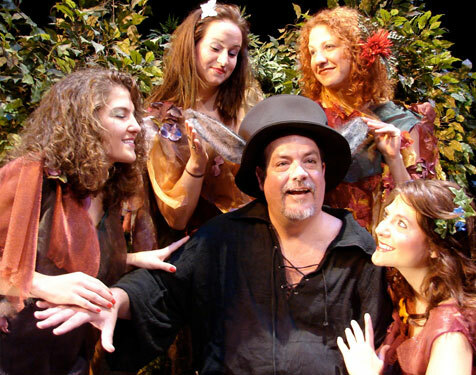 In 2003, PBSF established an “indoor home” as the resident professional theatre company of the new 700-seat Eissey Theatre, Palm Beach Community College, Palm Beach Gardens campus. During construction of the Carlin Park Amphitheatre, PBSF produced in other venues. In March 1993, PBSF in association with Mobil Land Development Co., presented the Florida premiere of Ray Bradbury’s DANDELION WINE with music by Grammy Award winning composer Jimmy Webb at the PBCC Eissey Campus outdoor amphitheatre; and in December 1993, produced ROMEO & JULIET at the JCC Gruber Hall Theatre, West Palm Beach. The 1994-95 season featured the production of EDGAR at The Eissey Theatre, a PBSF original play on the life of Edgar Allan Poe; followed by THE VANISHED PEOPLE in ‘1995, which was a PBSF original historical drama about Jonathan Dickinson’s shipwreck and survival on the Florida Coast. 1696, with choreography and dance by the Klein Dance Co; ANGEL STREET (’97) presented in association with the Helen Hayes Center of the Performing Arts, Nyack. NY; CHILI QUEEN, a new play by Jim Lehr (’98) which then toured to the Coronet Theatre, LA, CA. PBSF presented the feature theatrical event at the annual Bookfest of the Palm Beaches, a literary festival in South Florida, including: Ray Bradbury’s PILLAR OF FIRE (’91 – Bookfest’s inaugural year); Shakes-Shorts – AS YOU LIKE IT, (’92) – an original condensed version of Shakespeare’s comedy, which later toured to schools, The Norton Sculpture Gardens, and other community centers; Edward Albee’s ZOO STORY (’93 – with t.v./film star, William Katt) which later toured to The Crest Theatre, Burt Reynolds Theatre, and The Center of the Performing Arts in Martin County; the premiere performance of EDGAR, (’94) which was later developed for a production at The Eissey Theatre; the modem world premiere of William Shakespeare’s long lost play, CARDENlO (’95) which was further developed and produced off-Broadway in 1996; and PLAY by Samuel Beckett (’97). PBSF’s commitment to education is manifest through outreach programs. Many of its tours to public and private schools have been presented in association with Young Audiences of Palm Beach County (1988-1991) and Mobil Land Development Co. (1990 to present). Original educational programs include, Sold On Shakespeare. Acting Shakespeare, World Authors, and Shakes Shorts. In June 1990, PBSF brought arts and education to thousands of families in Carlin Park with the first annual Kidsfest: A Celebration of Children and the Arts, featuring professional and youth talent. In June 1996, KidsFest IV was held in the new Amphitheatre in conjunction with the Nation’s first annual Stand For Children Day. In 2003, PBSF performed CINDERELLA IN COMBAT BOOTS in the childrens’ arena at ArtiGras, an annual arts festival held in Jupiter, FL. PBSF also created the Jupiter Jazz Music Festival which premiered in June 1994, Carlin Park, featuring Grammy award winning artists..